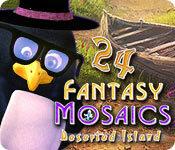 Fantasy Mosaics 24: Deserted Island is rated 4.2 out of 5 by 12. Rated 5 out of 5 by verimeri from improved The latest edition of Fantasy Mosaics has been improved over the previous. The pictures you form are now like small scenes instead of just one object. As always Fantasy Mosaics combines logic puzzles with great colors. Still getting my number 1 vote although Crystal Mosaics is running a close second simply because of their beautiful colors and logic based puzzles. Rated 5 out of 5 by klsuch from Love Fantasy Mosaics! I was excited to see another Fantasy Mosaics!! I enjoy the series! I would only make one suggestion. Make the story line objects more interactive. I was excited that this one was more interactive but would love to see more!!!! Rated 5 out of 5 by RenMac from I am hooked! I love this series of Fantasy Mosaics. I try to buy them all!! Keep 'em going, please! Rated 5 out of 5 by jil1 from Splendid Congratulations! The palette of colors is geting better and better. Bright and beautiful. It´s a pleasure play this game. 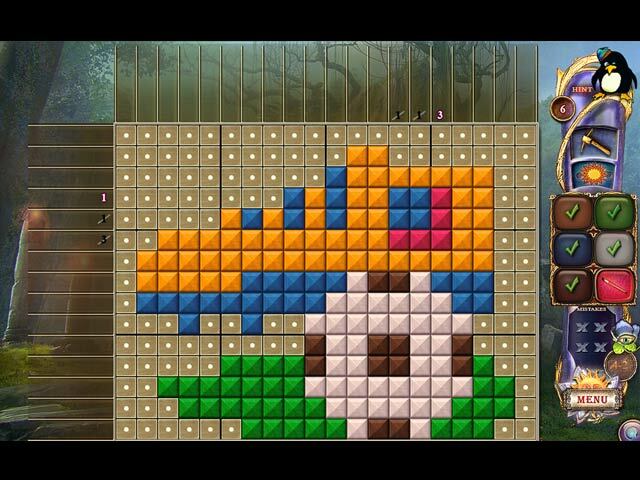 I love Fantasy Mosaics and the developers are making a wonderful job. Thanks to them. Sure I recommend this game. Rated 5 out of 5 by grandmacathy from Another winner! I love the griddler type games. This developer delivers every time. Rated 5 out of 5 by cleopatra23 from Hooked I am so hooked on all these Mosaics games! I buy them and play them repeatedly on different levels. I love the challenges and the artwork. I try to guess a lot which they do not recommend. Loads of fun!! Highly recommend. Rated 5 out of 5 by sunnyglow from EXPLORE A DESERTED ISLAND WITH MR. PENGUIN OVERVIEW: What a wonderful Monday surprise! We are off to a deserted tropical island with Mr. Penguin enjoying the magic of griddler puzzles. A BIG THANK you to BFG for offering a game in one of my favorite genres. This is another excellent 5-star game from Match Gems. I have been anxiously awaiting this latest entry from the series to appear on BFG. I have played every game in the series and this game is designed exactly like the others. I LOVE these games and Match Gems is one of the BEST developers for this type of game. This puzzle has many different names (AKA O’Ekaki, Griddlers, Paint-by-Numbers, Pic-a-Pix, Nonograms or whatever you call them); however, no matter the name, they are a fun puzzle game. 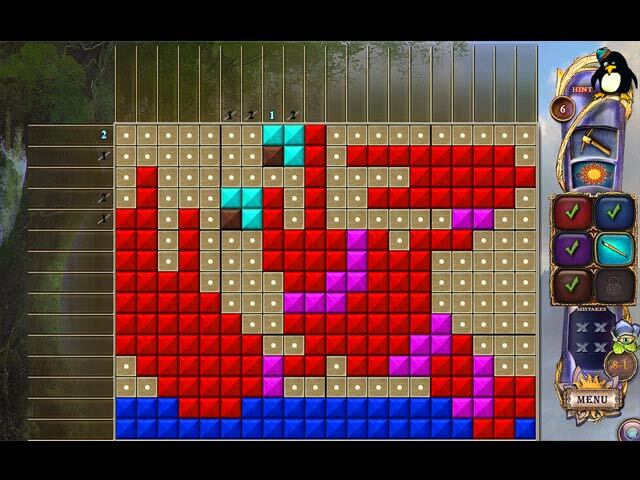 HOW TO PLAY: This is variety of a Sudoku puzzle. In this puzzle, create pictures by filling in squares in a grid. The grids in this game will vary in size. Each side of the grid will have numbers for each line of squares indicating the number of squares which are to be filled in for that row of squares. Squares are filled in where the squares intersect between the two sets of numbers on each side. GAME FACTS: • Levels: Casual and Advanced. 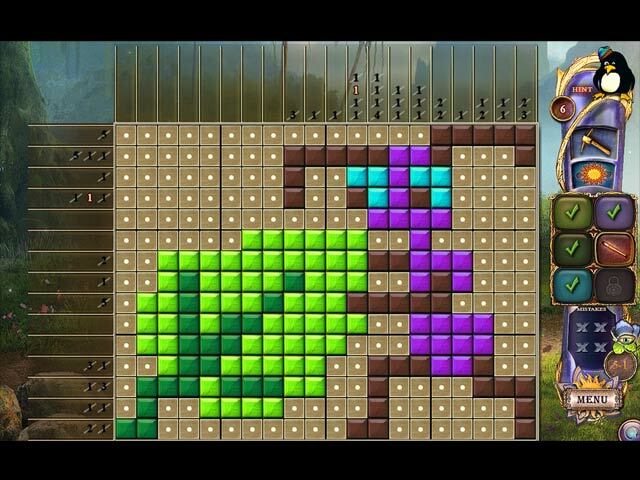 • Colors: The game has up to six colored screens which can be switched at any time while playing the puzzle. • Autofill: There is autofill so you do not have to fill in the unused boxes. However, you can use your mouse to right click “X’s” for unused spaces. • Hints: Hints are given as you proceed and are based on the difficulty of the puzzle and how well you perform in solving the grid • Number of Levels and Puzzles: There are 100 puzzles – 20 levels with 5 puzzles per level in the game. • Aids: You have a pickax as an aid in the game • Awards: There are 3 trophies: a gold trophy for no mistakes, a silver trophy for 1 mistake, and a bronze trophy for two mistakes. If you make 3 mistakes, you must start the game over again. • Collectibles. When you complete one level of 5 puzzles, you receive an item to place in your garden. I highly recommend this game if you like Sudoku games or any type of mathematical puzzle. Rated 3 out of 5 by LogieBaby from # 24 is just too easy All of these Match Gems have some appeal, more so for some folks than others. I own so many of these grid games that for me to add another to my collection, the individual game must hold some interest and more so offer a decent challenge. In the challenge area, # 24 falls way short. During the 1 hour demo, I completed 23 of the grids. That is way too many for me to consider a buy. I won't even use a free game code. As usual, the multi-colored grids are easy on the eye and all of the completed grids look as they are said to be. All in all, this is not a Deserted Island I care to be stranded on.